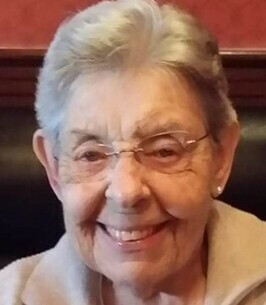 Marjorie Pitts Service Details - Whitby, Ontario | Barnes Memorial Funeral Home Ltd. Passed away at Strathaven LTC Bowmanville on Saturday November 10th, 2018 one day short of her 95th birthday. Predeceased by her husband Joseph H Pitts. Much loved mother of Doug Pitts and his wife Julie and Janice Greer and her husband Bev all of Oshawa. Grandmother of Tyler and his wife Tanya, Christine and her husband Richard. Great Grandmother of Cole, Ryan and Josh. Survived by her brother Gord Quick and his wife Nancy. So sorry to hear the sad news of Marjorie’s passing. I will always remember Joe and Marjorie’s kindness and friendship whilst living next door on Ferguson Avenue. Doug & Janice ... So sorry to hear about your Mom's passing, she did indeed have a long and full life. I have many fond memories of your mom & dad from many years ago, my thoughts are with you both.